BREVARD COUNTY, Florida -- Over 382 driver's licenses were cleared by the Brevard County Clerk of Court on Saturday during "Operation Green Light" where collection fees were waived for one day only. The Clerk's receipted more than 460 transactions totaling more than $165,000.00 in delinquent court fines and fees, including fees to reinstate driver’s licenses, according to Brevard County Clerk of Court spokesperson, Tyler Winik. In total, the participants saved approximately $40,000 in collections fees by paying during Operation Green Light. 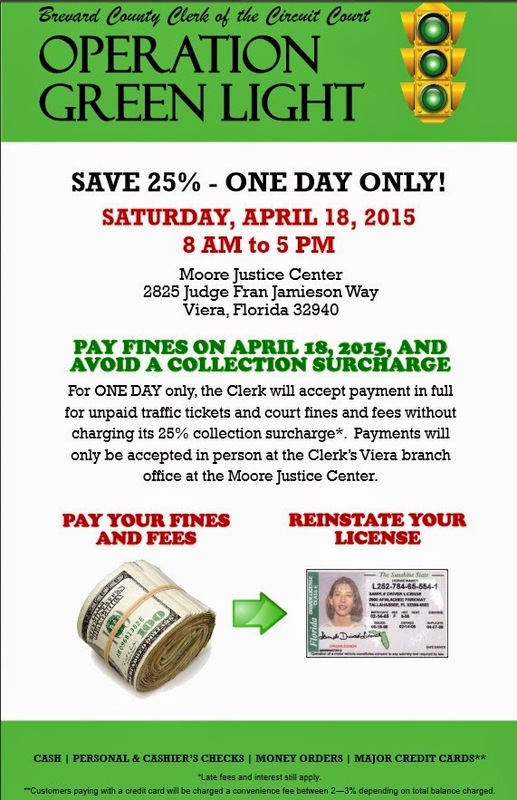 VIERA, Florida – For today only, the Brevard County Clerk of the Circuit Court will waive its 25-percent collections surcharge for customers with delinquent fines and fees. The event, dubbed Operation Green Light, will take place on Saturday, April 18, 2015, from 8 a.m. – 5 p.m. at the Harry T. & Harriette V. Moore Justice Center at 2825 Judge Fran Jamieson Way, Viera, Florida 32940. Customers whose unpaid fines have been sent to collections may take advantage of the event by paying the principal amount due in full, including any late charges. Payments will only be accepted in person at the Viera branch office. In addition, customers whose driver’s licenses have been suspended may be eligible to have them reinstated. The Clerk’s office will accept cash, personal and cashier’s checks, money orders, and major credit and debit cards for Operation Green Light. For more information regarding Operation Green Light, credit card processing fees, and reinstatement of driver’s licenses, please visit the “Announcements” page at www.brevardclerk.us. Customers with delinquent court fines and fees in other counties are encouraged to visit www.flccoc.org/ogl to obtain county-specific information.